If you're missing loaded potatoes but trying to cut carbs, give these loaded radishes a try! So cheesy and the radishes get nice and soft when you cook them. Heat the oil in a large heavy bottomed skillet over medium heat. Add the radishes to the skillet and sprinkle with the garlic powder, salt, and pepper. Stir to coat radishes in seasoning. Cook over medium heat, stirring occasionally, until radishes have softened and browned in spots, about 10-15 minutes. 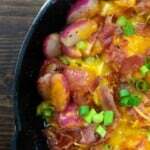 Turn off the heat and top the radishes with the cheddar and bacon. Cover the pan and let sit for 2 minutes to melt the cheese. Sprinkle with green onions and serve immediately. Drizzle with ranch dressing or sour cream before serving, if desired.